We present three geomorphologic and geological phenomena that have occurred in Algeria in recent years: (i) the Bab El Oued mudflow on 11 November 2001, which claimed several hundred lives, (ii) a soil collapse induced by sand liquefaction triggered by the Boumerdes earthquake (M w = 6.8) on 21 May 2003, and (iii) landslides that are threatening Constantine city, for which a hazard map is presented using a qualitative approach. 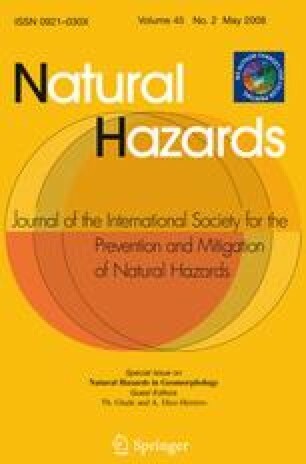 We briefly describe and analyze these natural disasters, and in the first two cases propose the application of geophysical techniques such as ambient noise recordings and electrical imagery to help evaluate their extent and potential threat. Finally a landslide hazard map of Constantine is proposed.